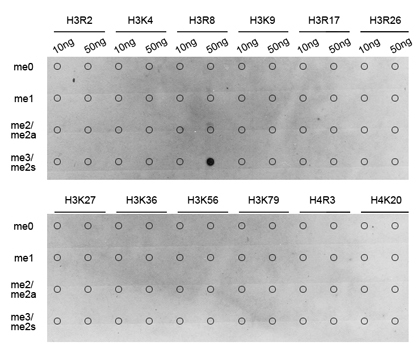 Dot-blot analysis of all sorts of methylation peptides using Histone H3R17 Dimethyl Symmetric (H3R17me2s) Polyclonal Antibody. Immunofluorescence analysis of 293T cell using Histone H3R17 Dimethyl Symmetric (H3R17me2s) Polyclonal Antibody. Blue: DAPI for nuclear staining. Histone H3R17 Dimethyl Symmetric (H3R17me2s) Polyclonal Antibody. Unconjugated. Raised in: Rabbit.